A theme for our first forest year has emerged for me: life within limits. Pickle and I set out to learn to live within the limits of the land and ourselves in hopes that in doing so, we could eventually become part of the regeneration of the land and, by extension, our community, our region, our culture, ourselves. One understanding I’ve come up against is that my life didn’t prepare me at all for what these limits might actually be. When you learn to garden, organic or otherwise, you’re usually presented with something more or less formulaic. Modern gardening usually assumes a relatively substitutable situation. There is open land and you either till it just as it is, make raised beds, or go no-till like we did. You then bring in x quantity of some amendment, y quantity of compost (or industrial fertilizer, or manure), water it at this frequency in this month for this region and use this much and this type of mulch / plastic / spray while weeding it so often. It can work pretty well for a while as long as you have these abundant inputs and can keep finding new land once you’ve exhausted the existing soil. When you grow this way, you don’t need to encounter so many limits or so much complexity. There are tidy rows, scheduling tasks, spacing guides, and formulas. To begin to garden, this approach can be very important. For my first garden, we just found some fencing in the woods and planted a few tomato and jalapeno starts, maybe adding some kind of random bagged fertilizer. We watered pretty often. By my second, I had read Toby Hemenway’s Gaia’s Garden and so I started with a really messy version of sheet mulching that probably went a little too anerobic, made largely as it was of mostly unfinished compost. The next year for that same garden I caved and brought in a few cubic yards of compost and I fenced it and kept the whole thing watered with a porous soaker hose. The life that came from that keyhole bed and the surrounding crescent shaped raised beds and that beautiful half-concrete unapologetic herb spiral helped me believe I could be a gardener. Suddenly I could join conversations about how my eggplant was doing, how the polyculture method seemed to provide all these wonderful benefits, how the insect life in my garden was singing with life. My heart soared. One Permaculture experiment that year did not do so well. I tried a totally-hands-off 3-sisters bed. I planted the corn, beans, and squash at the same time and wound up with a small keyhole jungle. The corn lodged and I didn’t at that time actually have any interest in harvesting beans so most just stayed in that jungle and fell in place. 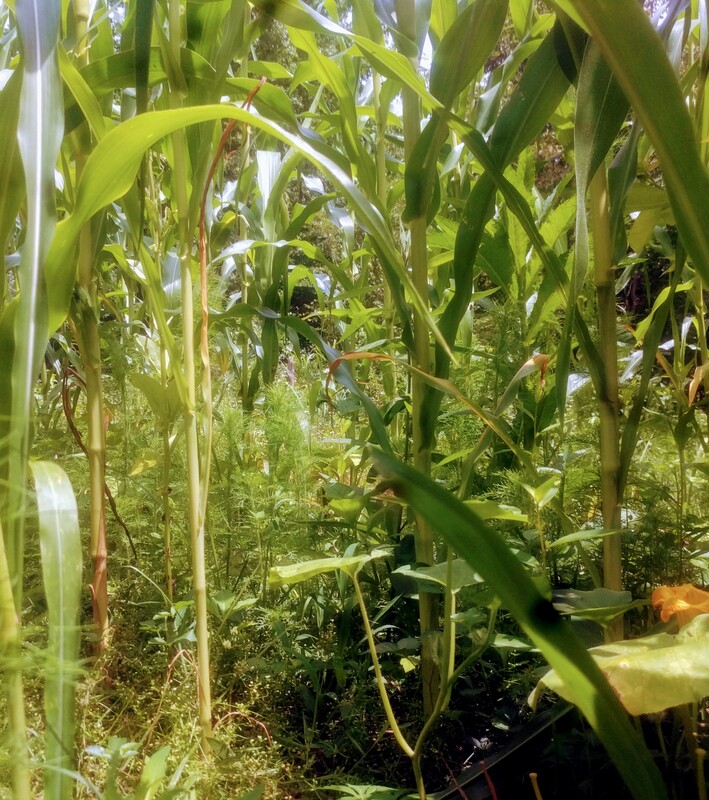 I felt sad when the beautiful corn collapsed but also understood that this was an experiment in the low-maintenance / self-maintaining systems part of Permaculture (… and for me, low-knowledge too, in that I didn’t know anything about how those three plants would grow together). Because it was an experiment in how little I could do, it had value for me. Things went where they were went and it was sad, but OK. I learned a limit. Today, I’m deep in a kind of welcome heartbreak that both hurts far worse and, because of the depth of that loss, connects me to spirit and the land far more than that brave frivolous keyhole bed years ago. Much in my early first in-the-forest garden has grown little or not at all. The sandy soil was early succession forest just 4 months ago. Part of the experiment of it has been to have no irrigation whatsoever (only use water from the land itself, preferably held in the ground and small ponds) and no outside fertility inputs (use the forest fertility, build soil, keep the life alive). It also involved keeping some of the weeds in place to cut and re-cut as green manure, keeping the tree stumps in place to aerate the soil and hold water, and not till at all, meaning no access to the easy burst of fertility that dying soil organisms release when we till. In this way of growing in the forest, we had no formula to follow. Without formula, we look around us for what could be a source of fertility, water, mulch, soil organic matter, and we try it. I planted two types of flour corn this year: two large beds of Cherokee White Eagle and one large bed of Oxacan Green. Guided by the teachings of fully alive human Martin Prechtel and my time learning from the rare mountain jewel of a permaculturist Zev Friedman, I’d begun the long journey to seeing corn seeds as one of the most precious gifts my hands could hold. 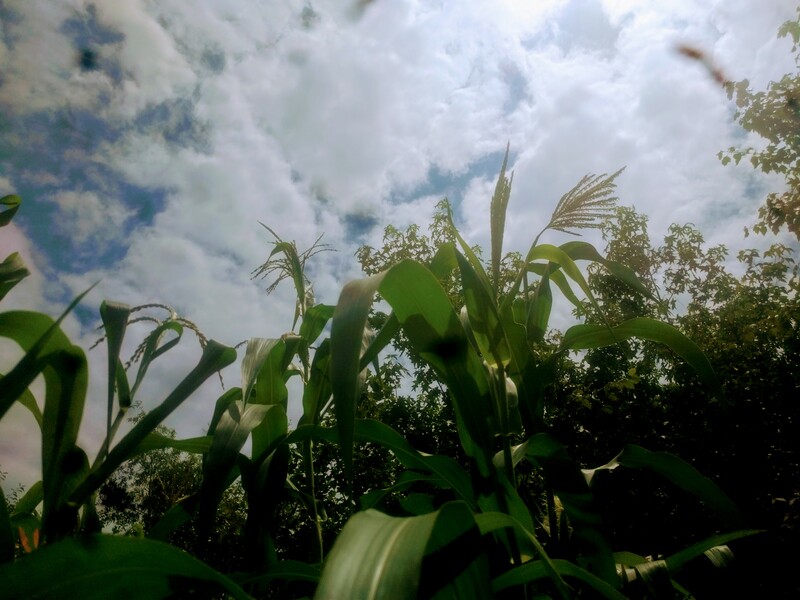 When the corn kept growing higher and higher above my head swaying in the wind ten feet tall in the bowl of the forest, I felt my heart leap through the trees. 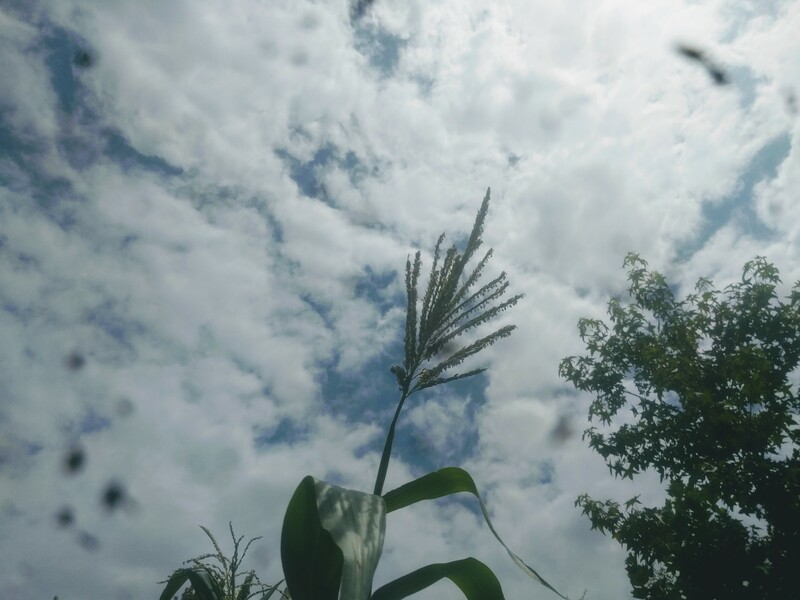 Without water or fertilizer and with some of the weeds left in place, the maize unhesitantly thrived. Standing in the back of the field and looking at the tall tassels, I felt like I was in the company of elders. A few weeks ago the Oxacan Green corn began to lodge – one stalk after another after another. The strength of the Cherokee White Eagle during this and the relative shortness and thinness of the stalks led me to think that it was just less adapted to drought or to our wild unamended sandy soil. A few days ago, the Cherokee White Eagle began to fall too. All at once, after a rain that followed drought, the corn stalks toppled. Such great heavy ears brought the ten foot stalks crashing down. I tried to tie some in tipis but I’d come back and found them fallen again. The weight was so great, the soil so loose, and the ground became painted with their emerald bodies, ears chewed through, silks strewn about the soil. Beings I love have died. Beings I love have died and in their death I have received a gift I think I could have received no other way. Back when I grew maize in the city and watched it all fall over, there was no question of having to depend on it to live. It was a ‘why not,’ a curiosity. Now as the maize fell in our field I could begin to imagine what it would be like if I needed their seeds to feed my family; if I couldn’t go buy more maize seeds next year and try again; if the prayer of this food was the only prayer we had and the stalks fell to the ground. One of the central lessons of my experience at Earthaven Ecovillage was something said by one of the residents of Medicine Wheel. He said we won’t all be community until we really have to depend on each other to live. Soldiers become like family because they have to count on each other to make it every day. In a village where each harvest is the life or death of the whole, the threads of interdependence weave a tapestry of peace and beauty. For me to hope to be in community with the plants and by extension, the animals, the soil, the rain, the sun, the earth, I have to actually depend on them. I need to be woven into a kind of sacred debt with them where my body is made of theirs and their wild hearts are tended by my hand which is really also their own. My stomach does not yet depend upon my plants. We go to the local co-op, we buy food, we survive. It is comforting and safe and we are deeply fortunate. Like everyone, I would choose safety for all beings over precarity, over the fear of starving; but I’ve come to believe that the safety of the grocery store is an illusion that delays a great oncoming suffering. When the last of the topsoil is lost by the last tilling, the last deep well runs dry from the pull of the last drop of the aquifers, the last soil amendments are distributed by the last of the cheap oil – in some ways we are already there in the bodies of our older selves, in future beings, and buried in the earth, the safety already over, reality already vivid like tilled up clay crying out the last of its minerals in the rain. I am safe and I am threatened; I am in fortress middle class America and I am unemployed and frying up pine bark on a fire in the lean time; and so, I know what it is to depend on the plants for food and I also have no idea what it is like to depend on the plants for food; but I am certain that I know what it is like to depend on the plants for spirit. I have told it a thousand times, but the real reason I stuck with gardening was the before and after of my own spirit. I tried gardening because of an ideal and most things I tried because of an ideal did not stick. What stuck was the way the soil changed me. My fumblings in the community garden near my house magically made me forget my anxieties for a time. I would stay in the garden for hours and hours without any awareness of digital time. Where I absolutely depend on the plants and would be nothing and would be dead without them is my heart. They are my teachers and healers, they are myself. I am grateful for the lesson of my precious fallen maize even as it makes me want to cry and cry and cry. If there is a Spring, if there is a rain, if there is sun, if I can ask the wild weeds for their vitality to feed the soil, if the young trees can offer their bodies to the fire to become charcoal for the soil, if there is a wind, if there are insects and birds, if there is a community of human support to walk Pickle and I through another many months to the Spring in this sacred forest bowl then I will bring maize to the field again, I will watch them like a mother even as they are mother to me, I will plant a seed as a prayer knowing something more this time about how that simple act offered beneath the stars is the most fragile and true hope my hands can ever come to express. I am grateful for the revelation of these first limits in how far we can go in growing food in the wild. I am grateful that in the meantime, we can still eat. May the pains of our losses be lanterns on the path through the forest to a field that nourishes the earth and all of the beings it dreams. …that because my young body had been made mostly of corn syrup and corn chips and corn-fed animals I didn’t want corn in any garden I’d grow. Now even as I turn more and more towards perennials, I hope to grow a jungle of maize every remaining year of my life. As far as I can tell, if I try to figure out what “invasive species” means from how broadly people use it, it usually just means any plant, animal, or insect that does well in its circumstances.